Group Account Users have access to Shared Folders and Shared Templates. The Shared Folders area can be used to share documents with the group. Documents can be made read-only for presenting information, or editable by anyone for collaborative work. The Shared Folders area is also particularly useful for browsing and managing the work of users without needing to access any external locations, such as a server system. The Shared Templates are can be used for sharing Grid templates with other members of the group. Shared Folder permissions are set on the individual folder. 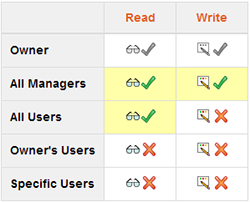 Shared Template permissions based on what kind of user you are (Admin, Manager or User). Administrators and Managers can create top-level folders in Shared folders. They can also set read and write permissions for Users. Top-level folders - When you first create a new top-level folder, only you (the Owner of the folder) will be able to access it. You can change the permissions on the folder to begin sharing it with your Users. Subfolders - New subfolders will take on the permissions of their parent folder, but their permissions can be changed at any time. To create a folder, go to Shared folders and click the New folder button. You will be asked to choose a folder name. You can also choose a symbol icon for the folder. To set the permissions for a folder, browse to it and then click the Settings button. You can also set permissions for who can access the folder. Note: Administrators and the folder Owner always have full access. Classes 1 and 2 cannot see each other's folders because they have different managers. You can set Read and Write access for any folder. Subfolders will automatically inherit the permissions of their parents, but you can set them to be different. Users can see all the contents of the folder, and create and edit all documents. Users can see all the contents of the folder, but cannot create or edit. Users can create and edit their own documents, but cannot see documents created by other users. The folder is completely hidden from Users. As well as setting permissions for everyone, or a Manager's Users, Administrators and Managers can also give specific users access to a folder. This might be useful, for example, if you have an after-school club, where only selected users should be able to contribute work. 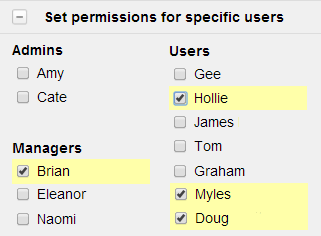 When you set read or write permission for ‘specific users’ you will be presented with a list of every user in the group to select from. Setting Specific Users permissions is possible on top level folders only. You can create your own grid templates by editing any of the standard Widgit Online templates. In a group account you can share these templates with other group members by moving them into the Shared Templates folder. Admins and Managers can do anything and everything in Shared Templates. This includes renaming, moving, copying, deleting, editing and creating a new document from the template. Admins and Managers can also create folders inside of Shared Templates. Admins and Managers can also move templates into the root of Shared Templates. Users can not do everything. Users are limited to Copying and Creating documents from the template.